The douc langur is one of the most colorful living primates. Because of its attractive and magnificent colors, it is sometimes called the "costumed ape." It can also sometimes resemble a little Buddha, wearing a gray shirt and black shorts. Three subspecies of the douc langur are recognized: the red-shanked douc langur (Pygathrix nemaeus) found in Vietnam, east-central Cambodia and possibly in China (on the island Hainan), the black-shanked douc langur (Pygathrix nemaeus nigripes) found in southern Vietnam, southern Laos, and eastern Cambodia, and the the grey-shanked douc langur (Pygathrix nemaeus cinerea) found in the central highlands of Vietnam. Although all three subspecies can be distinguished by their different color patterns, all have gray bodies, white tails, and big pot-bellies. The legs of the red-shanked douc langur are black, with a maroon-colored "leg warmer" look from knee to ankle. Its forearms are white from the elbow to the wrist. The body is gray with marks of gray, black, and white. The black-shanked douc langur has all black hind legs and gray forearms. Its chest fur is lighter than the rest of the body, and its face is black. The gray-shanked douc langur has mainly gray fur, with black shoulders and a white chest, neck, and tail. Within each subspecies group, there are no color differences between males and females except for the different colored spots appearing on their rumps. Adult douc langurs weigh 24 lb on average. Females are smaller and weigh 18 lb on average. The average head and body length is 24 to 30 inches, and the tail adds an additional 22 to 30 inches. Their stomachs are sac-like and are equiped to assist them in breaking down plant cellulose and getting nutrition from it. They prefer to remain in the trees and are excellent climbers using their tails, arms and legs for balance. They are great at jumping through the trees and are able to leap up to 20 feet. Douc langurs can be found in a variety of habitats, including lowland to mountainous terrain (up to 6600 feet) and deciduous, primary, and secondary rainforests. They prefer to remain in the mid to upper levels of the canopy, and are mainly active during the day. Like most monkeys, they are social and playful creatures and live in groups from 4 to 15. Some groups of up to 50 have been observed. 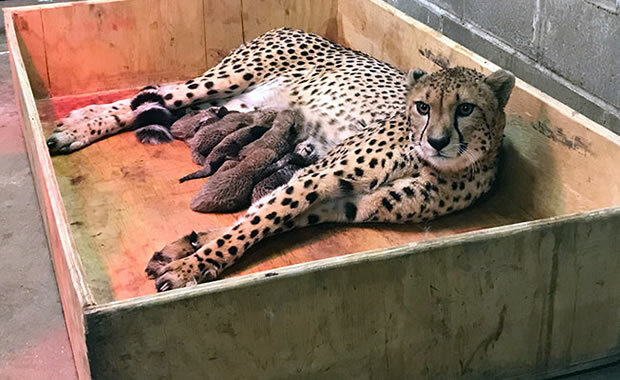 Groups generally consist of one or more males, and two females per male. Diet consists of leaves, shoots, fruits, buds, and flowers. Mating occurs in August to December, and the female gives birth to one to two offspring after a gestation period of 165 to 190 days. The population size of this creature is not yet known, but conservationists believe that there are just a few thousand left in the wild. The decline of this species is due primarily to hunting by humans for food and sport. Also, the forest habitat of this species experienced intense disruption during the Vietnam war. The species is now protected by Vietnamese law, although they are difficult to enforce. Some douc langur populations can be found in reserves, such as the Bach Ma National Park and the Kong Cha Rang and Kon Khi Kinh Nature Reserve in Vietnam. Copyright Notice: This article is licensed under the GNU Free Documentation License. It uses material from the Wikipedia article "Red-shanked douc". Glenn, C. R. 2006. 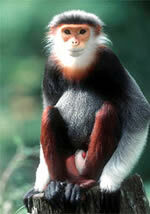 "Earth's Endangered Creatures - Douc Langur Facts" (Online). Accessed 4/24/2019 at http://earthsendangered.com/profile.asp?sp=228&ID=3. Need more Douc Langur facts?